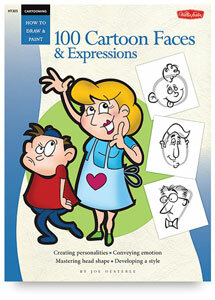 100 Cartoon Faces & Expressions covers all the fundamentals for creating cartoon heads and faces. Part of Walter Foster's popular "How to Draw and Paint" series, this book includes instruction on selecting face shapes, rendering features, and exaggerating those features to suggest mood and personality. It also offers a wide range of step-by-step cartoon heads so beginners can practice with a variety of expressions before applying them to their own characters. Inspiring tips on the animation process and information on using computer programs to enhance and color your characters is also included.